The intention is that the water is expelled as much as possible from the food. Microorganisms not thrive there and the food will not (fast) decay. Drying can take a long time. Many products therefore change very much in shape, color and taste. You may possibly in advance marinate, season, salt or sweet food. It is the oldest and most reliable method to preserve food for a long time. For soft fruit it takes too long (cherry, strawberry), they can dry only if adding a lot of sugar (confit). Raisins are dried grapes. Due to be watered previously in potash, they remain light in color and dry by the caused cracks in seven to fourteen days instead of 20 days. The most common and major grape varieties for raisins is the Sultana. Raisins have a high sugar content of 64 g. per 100 gr. The raisin is a dried, seedless, small grape vine (Vitis vinifera ’korinthiaki’). The name comes from the port of Corinth in Greece. Currants brownish to dark blue. The darker the color the sweeter the Black Corinth is. The sugar content is 60%. The reddish (possibly dried) fruits of Amelanchier (Amelanchier. - Laevis : Drenthe -, - Ovalis : European -) are edible too. There are 25 species of shrubs in this rose family. Leafy vegetables like lettuce are not suitable for drying, not at all to subsequently hydrate them again. Also hard vegetables (carrots) are better priory blanched. To save plums (more general: drupe) well you should evaporate about 95% of it’s moisture present, causing them to shrink significantly. In the residual heat of the bread oven it takes between 8 hours and 1 ½ days. Sun drying easily needs five to eight days (here). It also dries well on the stove or radiator. In a gas furnace combustion of (natural) gas also produces water vapor. Fine heat transfer if you bake bread, but to dry something the door should certainly remain sufficiently open. If the temperature is not higher than about 50 ⁰C (up to max. 70⁰C), many of the power values and vitamins stored in the fruits are preserved. Treat with a solution of vitamin C, citric acid or lemon juice ensures that the dried fruit discolore less. You can either dry whole prunes with pit as pitted stone fruits or dried halves. 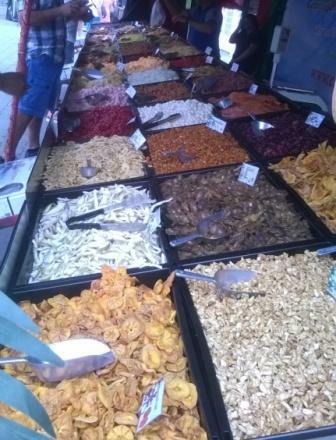 Dried fruits weigh five to ten times less than fresh fruits. Bread can be kept long if you cut it into slices and bake again: you will get biscuits (round), zwieback (square) or crisp bread (very thin). Assuming that it is kept dry. The white fungus on dried sausage (e.g. the long, thin, Catalan Fuet) is the Penicillium candidum which can also be found on Brie and Camembert. It is pre-applied to prevent the product from drying out too quickly. If the outside dries too quickly (case hardening), the moisture from the core can no longer be removed. Some mold layers only develop during drying (and fermentation). It ensures a typical taste. You can eat the fungus just like cheese. You can also wipe it off. Industrial producers roll the sausage through (rice) flour because it looks traditional. In order to dry meat it is best to remove as much as possible fat (and blood), and to salt the strips of meat. Salt draws moisture from the meat. Beware of micro pirates, waiting for a chance. In South Africa, dried meat is called biltong, in America the snack is called beef jerky. Before you use dried food you can soak it (one-half to one and a half hours) in (cold or warm) water. Nutrition drying is similar to dry the laundry. Spread and unfurl it. Use thin slices, no lumps. Cut them all as thick (or thin! ), so they dry evenly. So get a very dry storage, otherwise the stuff will still get moldy. In the Andes the small tubers of the ’papas’ were spread to freeze overnight. Then they were peeled and crushed (with the feet) to drive out moisture. This in turn freeze- drying was repeated a day or 3. The mass was then further dried in the sun to ‘chuño’ and stored. It was later ground into flour, or cooked as porridge.